Brad and I had a dreidel party this weekend, which was hilarious and a total blast. For the “festive Jewish food” that Brad had promised, I made mini latkes with a toppings buffet. 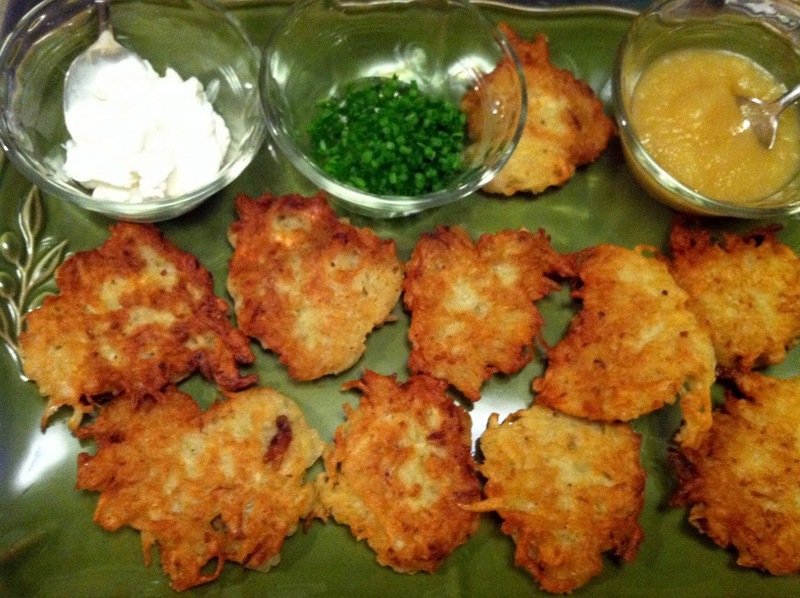 This was my first shot at making latkes, so I took it as a good sign when Brad took his first bite and said that not only had I “made a Jewish man proud”, but also that this was his favorite thing that I’d made all year. What the what!!! These were adorable, and delicious, and a big crowd-pleaser. They also keep really well for reheating, so if you want to make them ahead of time, just pop them in the oven for 15 minutes or so before your guests arrive to re-crisp them. 1. 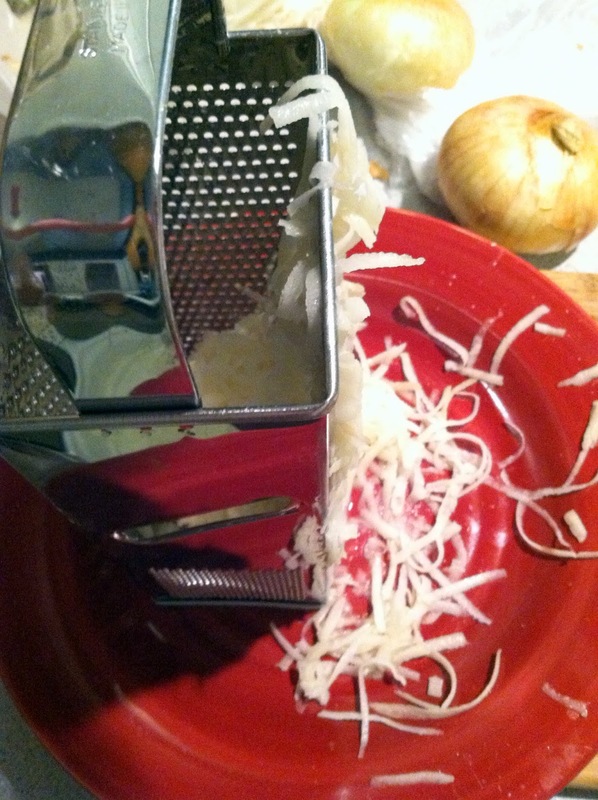 Using a grater or a Food Processor, shred the potatoes and the onions, trying for the longest strands possible of each. 2. Working in smaller batches (I had about 3), add the potato shreds to a medium size piece of cheesecloth. 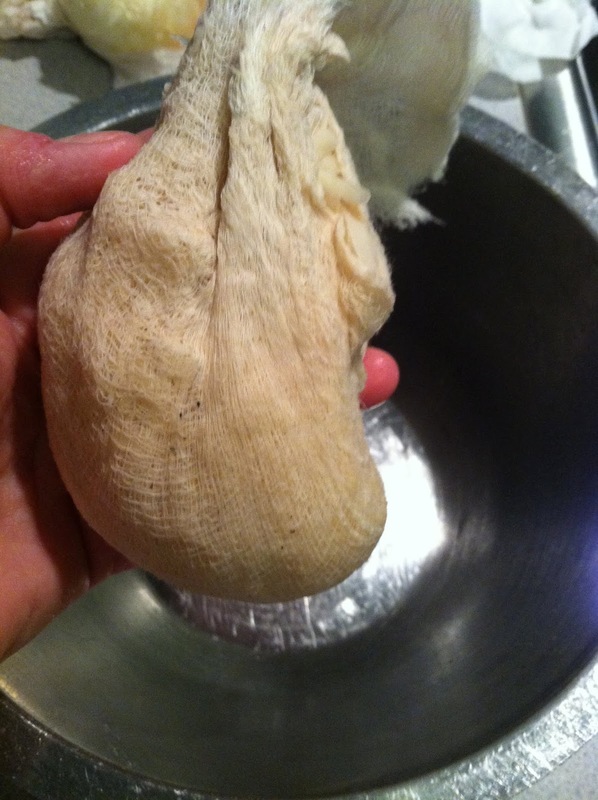 Put a small bowl underneath the cheesecloth to catch the liquid. 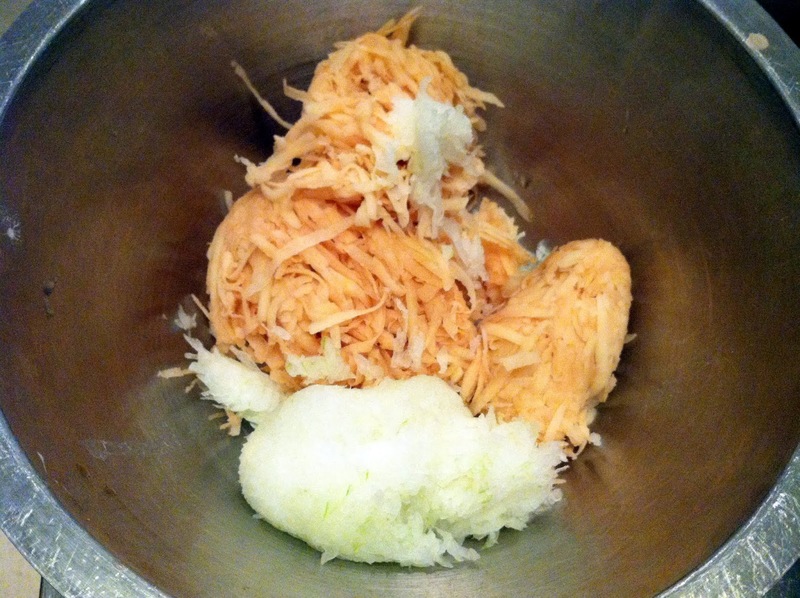 Wring out the shreds into the bowl to extract as much liquid as possible. 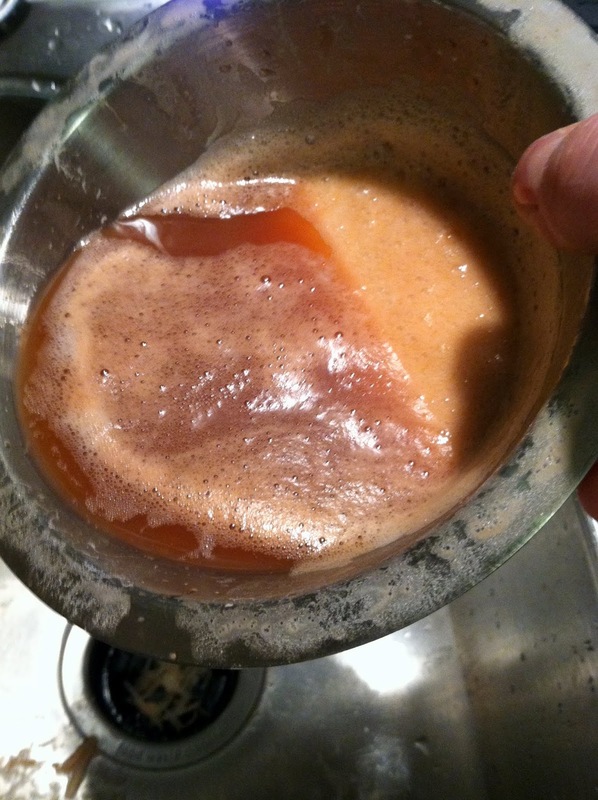 Let the liquid stand in the bowl – don’t throw it out! It’s about to do something completely bizarre that will help bind your latkes, and also keep them from turning grey. 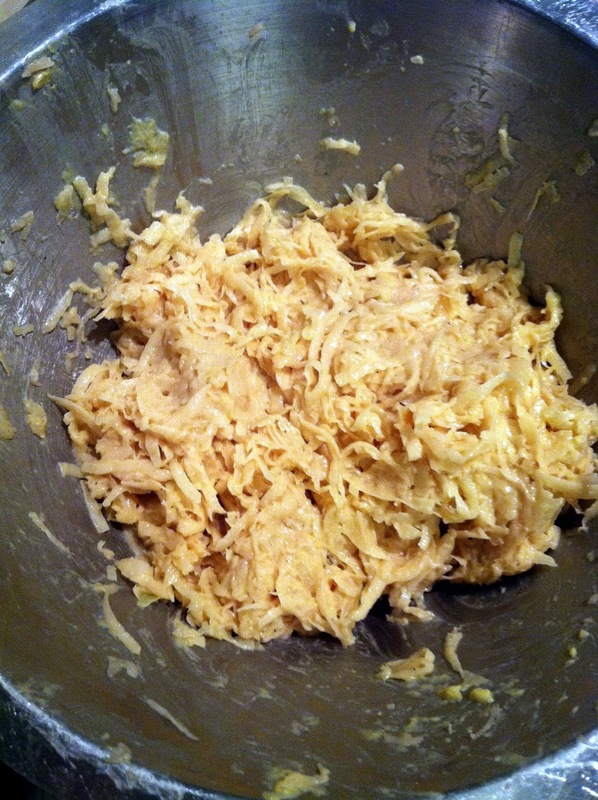 Add the potato shreds to a larger mixing bowl. 3. 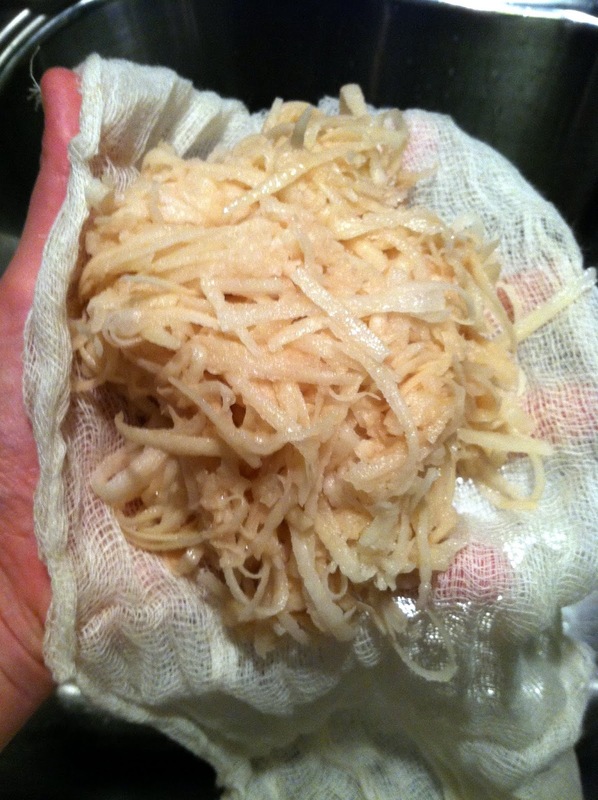 Add the onion shreds to the cheesecloth, then wring out the liquid and discard it. Add the onion shreds to the bowl with the potato shreds. 4. 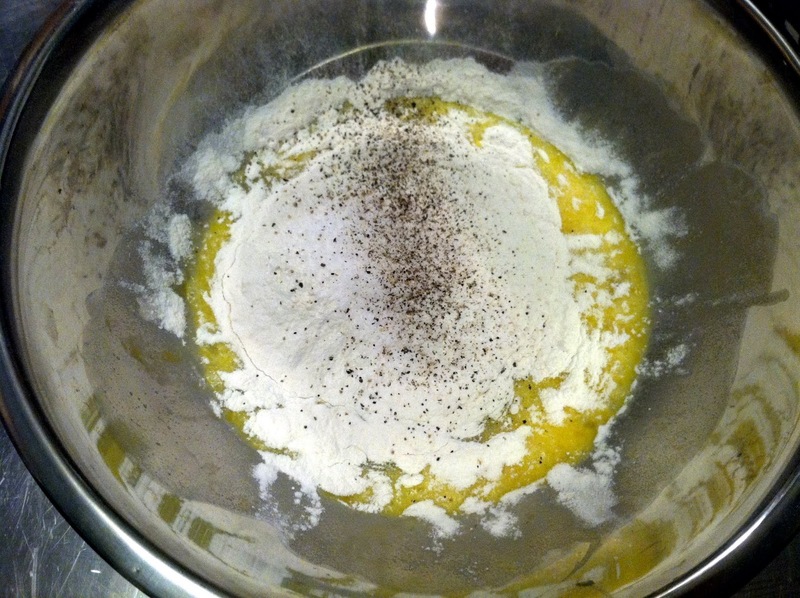 In a different mixing bowl, combine the lightly beaten eggs, flour, salt & pepper. 5. Pick up the bowl that contains the potato liquid, and tip it to discard the liquid that runs out. 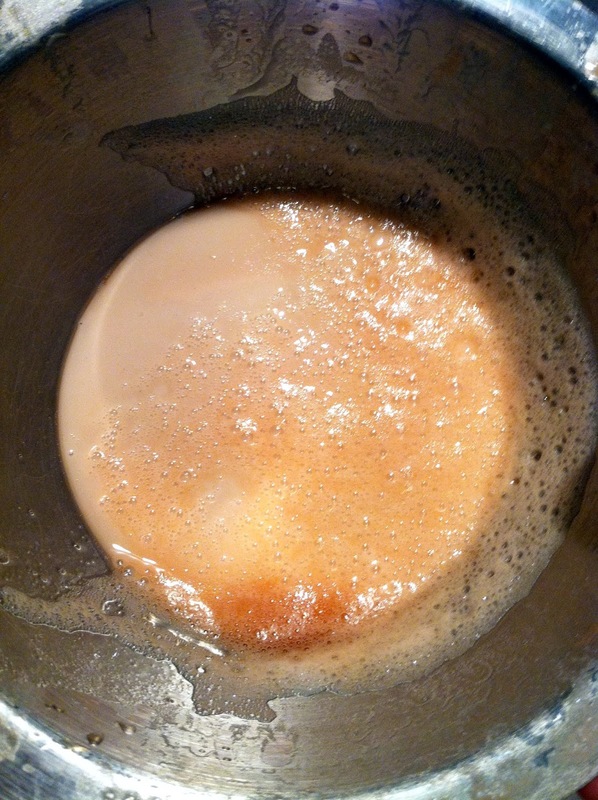 The mixture should have settled into two layers – a liquid and a solid. 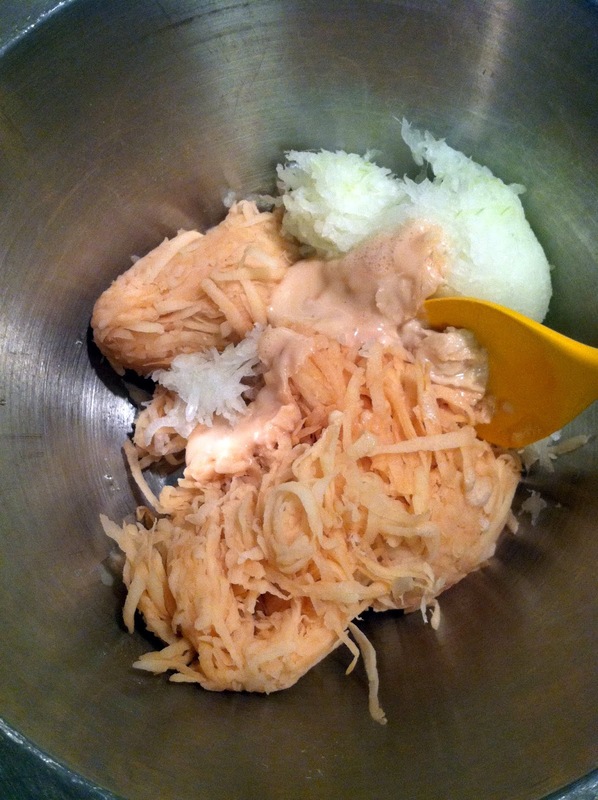 The solid at the bottom of the bowl is the potato starch – this is the secret to latkes! Scrape that starch into the potato and onion shreds, and stir to combine. 6. 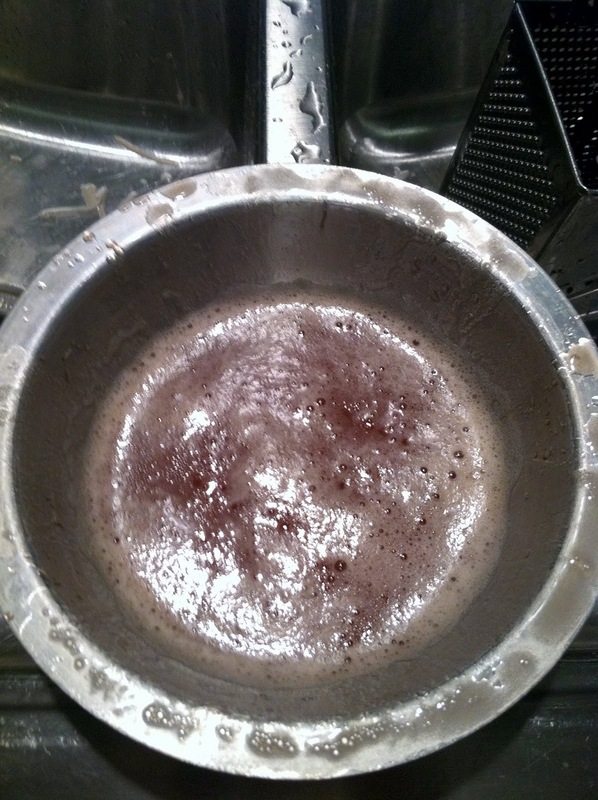 Add the flour/egg/salt & pepper mixture to the potato/onion/starch mixture, and stir to combine. I dug into it with my hands, because it was easier to mix that way. Either way, though. 7. In a large skillet, or ideally, a Le Creuset pan, heat a thin layer of vegetable oil over medium high heat until hot. 8. Add approx. 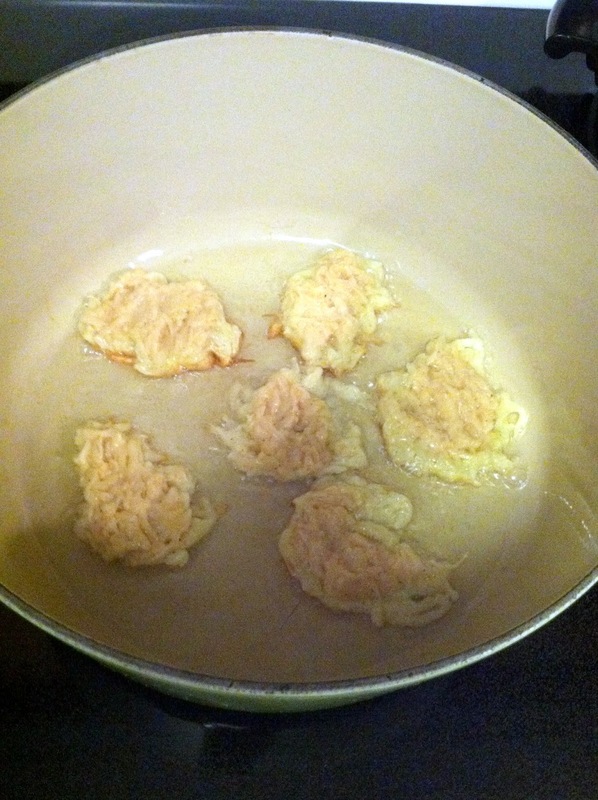 1 teaspoon of latke mixture to the oil, flattening slightly with the back of the spoon so they cook evenly. 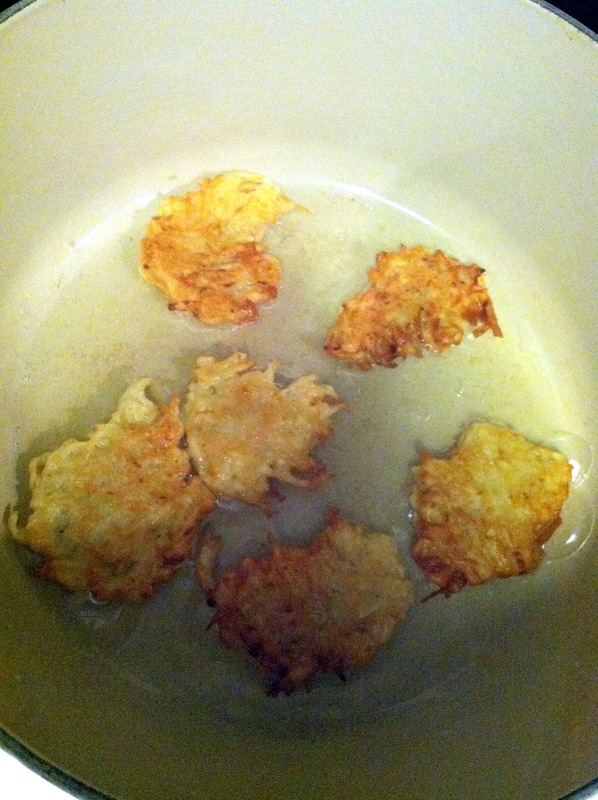 I found that I was able to add about 6 latkes at a time to the pan, working in a clockwise motion, so that by the time I added the last latke, the first one was ready to be flipped – and so on. 9. 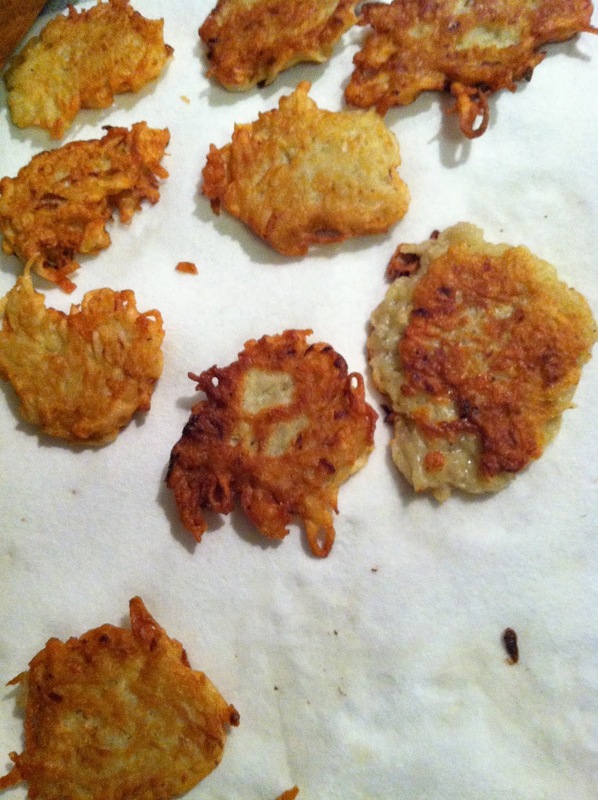 When latkes are browned on both sides (they crisp up pretty quickly), place on a layer of paper towels to drain. 10. Keep warm in the oven until ready to serve, then arrange with little ramekins of sour cream, fresh chopped chives, smoked salmon, creme fraiche, and applesauce. 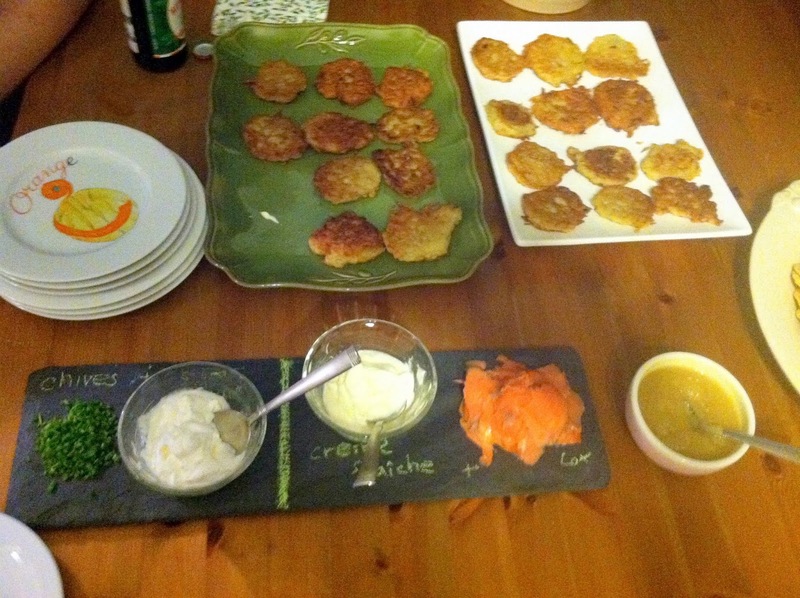 This entry was posted in favorites, latkes, potato pancakes, winter on December 19, 2012 by westyn.